Back in 2003, I released a Mix CD called YEAR OF THE GUN. It collected some of the biggest “Gun Tunes” cut in Jamaica in the early to mid 1990s. It was a controversial CD and a lot of folks got angry that I was making a tribute to music that celebrated such violent content. 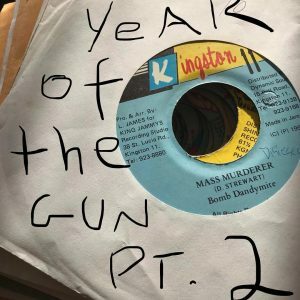 I had no doubt then, nor do I have any doubt now that gun tunes themselves are a deeply problematic aspect of Jamaican music; however, Jamaican music has had tunes about guns and rude boys since the very dawn of Ska back in the early 1960s. More to the point, music and art about violence have been around since, well, since the beginning of art itself and my opinion will not solve any debates. What I hoped to show in Year of the Gun was the way in which the singers and DJs took the theme of violence and elevated it through metaphor, delivery, etc. into something closing in on the sublime; and when all is said and done, taking violence and turning it into art will always be positive. For a long, long time I wanted to make a sequel to this mix containing some more obscure tunes and some tunes that I basically just forgot about. It took me 16 years to do it, but I did it, so let me introduce YEAR OF THE GUN Part 2.